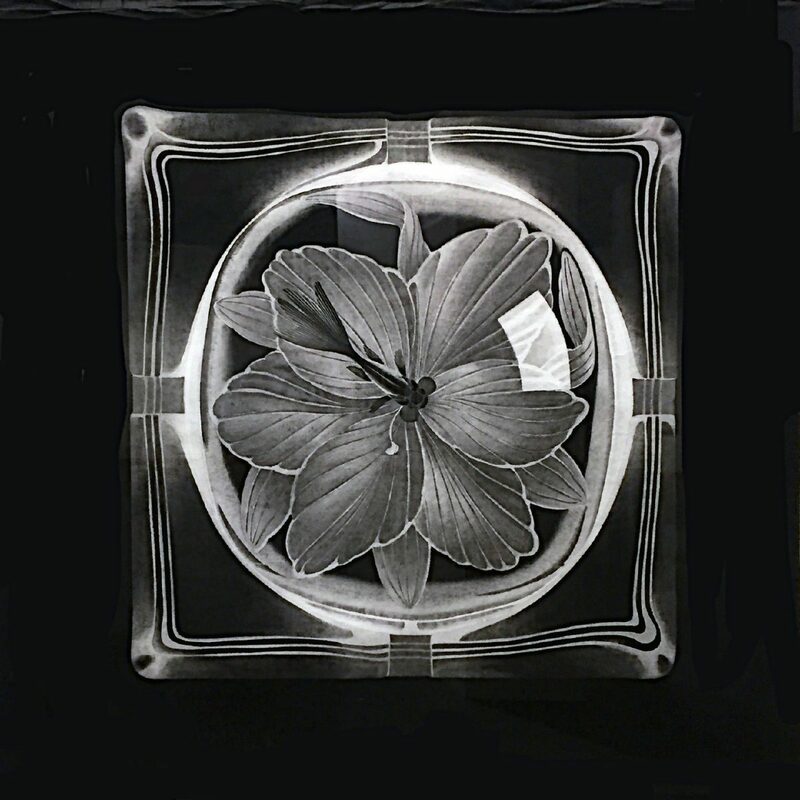 “The Fifth Shinzaburo Takeda Biennial of Printmaking” offers surprises along with a treasure-trove of aesthetic pleasures. This year, China was invited to be the guest country with Chinese prints offering an interesting cultural contrast to the Mexican works. The Biennial consists of 60 oversized contemporary prints — 48 of them offering a satisfying and wide variety of printmaking techniques from 26 Mexican states; 12 prints are from China (it took me an hour of thoughtful looking to see them all). The Biennial is now on display at International Museum of Art & Science’s Clark Gallery. Differences and similarities are notable between the two country’s artistic styles, particularly the contrast of psychological aesthetics. While the Chinese artists demonstrate emotional distance in their prints, the Mexicans go all in for psychological weight and drama. 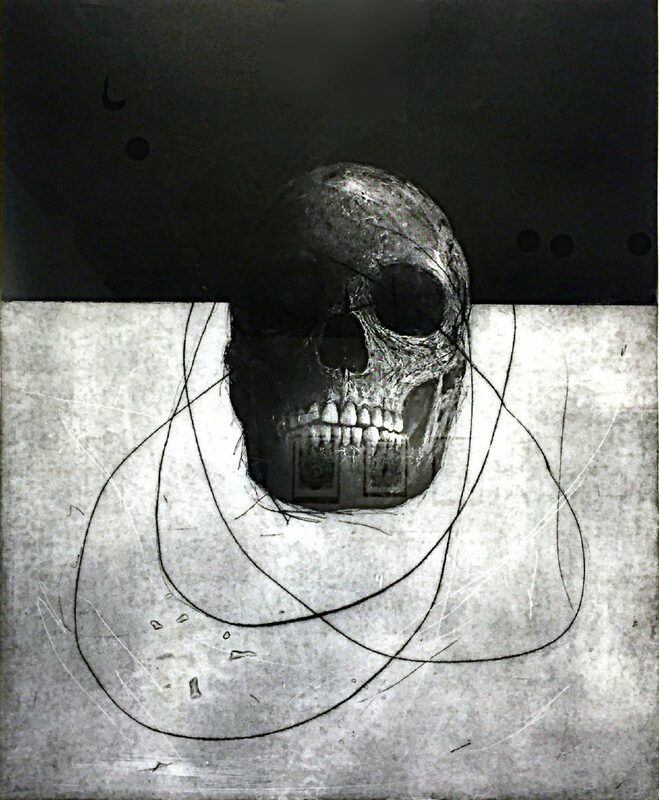 Underlining the Mexican obsession with death, Carlos Casteñeda’s mixed technique print, “With Light My Existence is Visible ll,” was judged first place winner in this show. Mexican print artists savor gutsy textures and the Chinese are masters of quietly gradual tones. 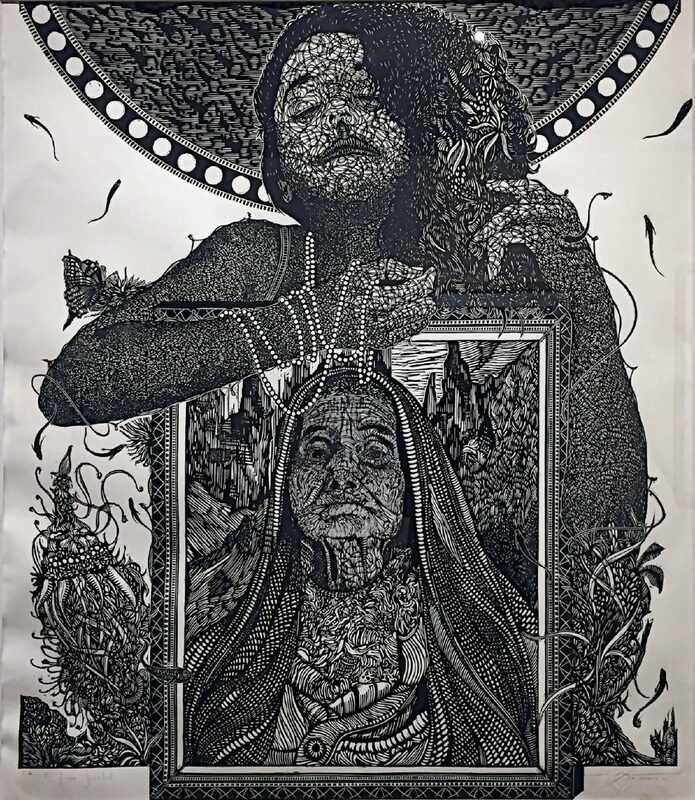 Reflecting the richness of the country itself, Mexican printmakers often use pattern and texture for opulent and unusual shading effects, as in “Eternal Youth” by Alan Altamirano. In this print, the skin treatments of both women are creative declarations of linear frolicking and complex mark-making. Both countries allude to their artistic histories. The Mexican prints reference Mexican culture emotionally and symbolically. For the American viewer, this offers some communication problems for those not versed in the deeper aspects of the Mexican mindset. By contrast, the Chinese prints definitely reference their culture, but in a more objective way. For instance, two prints depicting music offer a point-of-view contrast. 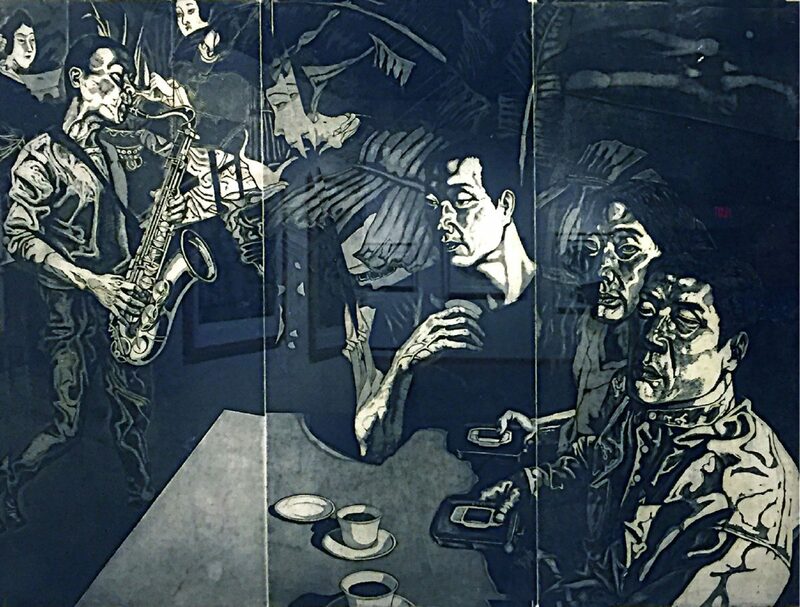 “Coffee Shop Music” by Chinese printmaker, Ying Jinfei, shows friends seated at a table; a musician and images of Geishas perform away from their sight. The reference to their history appears passive, fading from consciousness, yet still there. 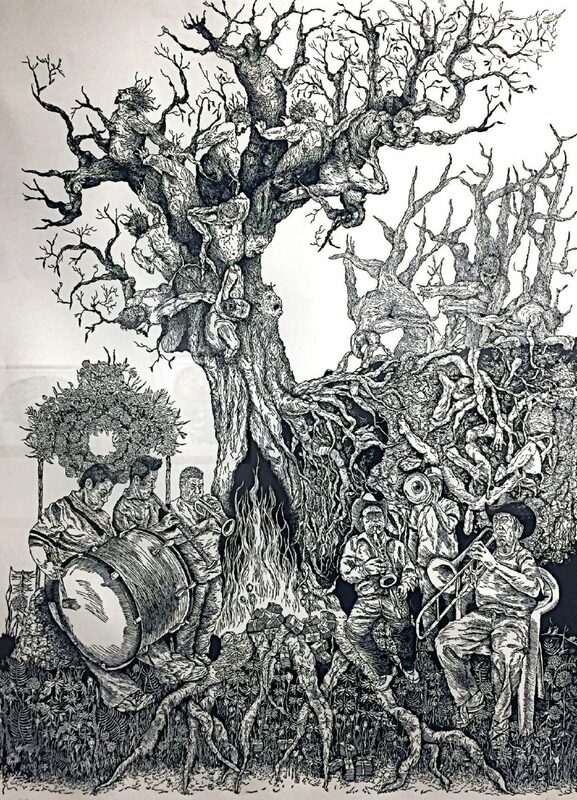 “The Dark Root” by Orlando Velásquez from Guerrero, shows two groups of musicians — a young trio and an older trio. They perform at the roots of a tree whose dead limbs bear tortured souls in their physically shared metaspace. While the Chinese print feels meditative in nature, the Mexican print is emotionally disturbing. Mexico’s history is woven through emotional visualization in these prints, expressing inner and outer struggles with existence; the Chinese prints have a mellower undercurrent. Two prints that lend themselves to comparison in their historical compositional influences are “The Epoch of Tourism” by Fang Limin of China, and “Seven Paths” by Antonio Ruiz from Durango. Both prints reflect traditional compositional devices from their respective countries. Limin’s woodcut is strongly reminiscent of the Qianglong emperor’s historic tour of south China, showing overhead vistas of travel highlights. In his print, Limin’s travelers are middle class Chinese tourists, but his scale and perspective is comparable to the earlier work. “Seven Paths” pays homage to Mesoamerican codices. Although Ruiz adds a few newer symbols, the centered eye is there along with traditional glyph symbols — all Lino printed on the traditional papel amate. 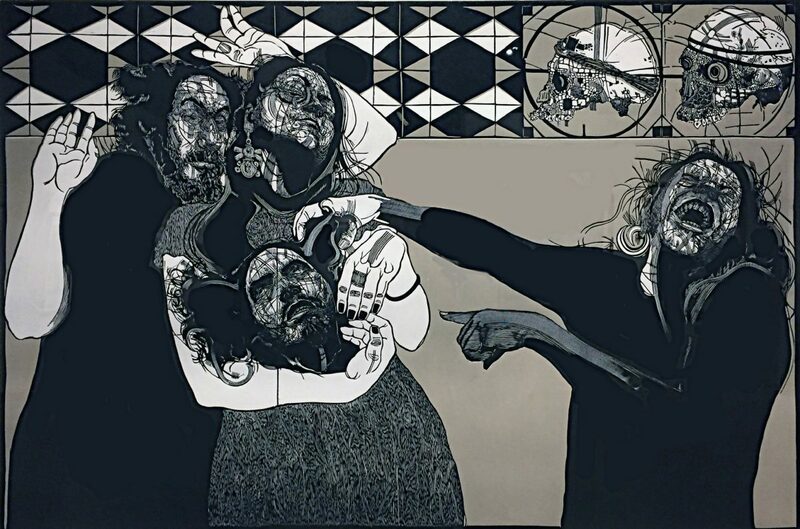 The Biennial was created in 2008 through the efforts of a group of Oaxacan artists headed by Japanese Printmaker Maestro Shinzaburo Takeda as a way to promote contemporary printmaking while supporting the use of traditional techniques. 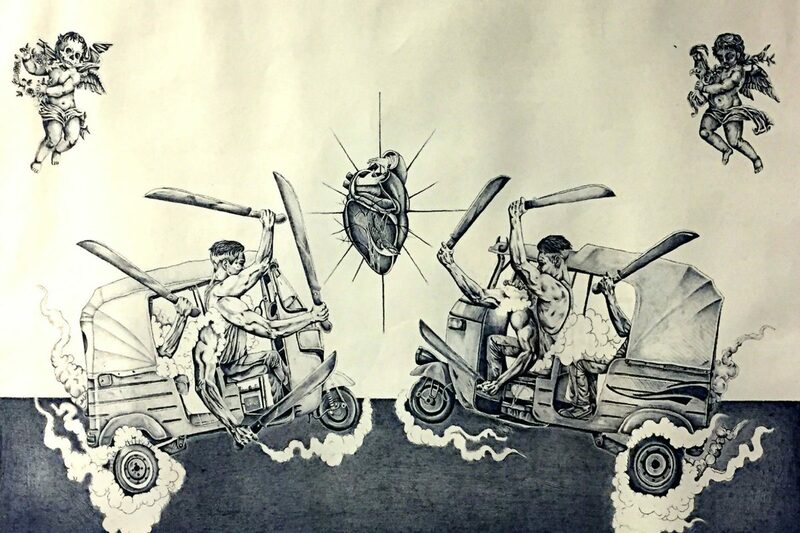 It has made the city of Oaxaca a major center for printmaking. This Biennial opened in Oaxaca and has traveled to Veracruz, Mexico City, Durango, and Yucatan with its final venue in McAllen, its only U.S. destination. The 5th Mexican Shinzaburo Takeda Biennial of Printmaking is an excellent exhibition and McAllenites are fortunate to be able to view this superb body of work. Hours: 9 a.m. to 3 p.m. Tuesday to Thursday; 9 a.m. to 5 p.m. Friday; 10 a.m. to 5 p.m. Saturday; 1 to 5 p.m. Sunday; 9 a.m. to 8 p.m. on first Thursday of the month.